Fight Melanoma Cancer – Work Out: Meters for Melanoma 2018 is Here! Fight melanoma cancer and get your row on at the same time! METERS FOR MELANOMA, our annual fundraiser to support research and education by the Midwest Melanoma Partnership is back for a second year, bigger and better than ever. We’ve added prizes – ERGS! – for top fundraisers and, thanks to a $20,000 challenge grant, your donations are worth even more this year. REGISTER NOW to either row as an individual, or get your small team (25 or fewer) or large team (26+) together and plan to raise funds and row meters together. We’ve made the meter distances accessible for pretty much anyone. You can row as few as 500 meters, or 5000 meters, or beyond. Not into rowing? Just want to support the cause? No problem. You can even donate to register as a Virtual Rower and your entry will count towards the prizes. WIN A ROWING MACHINE, SKIERG or BIKEERG! This year we’re sweetening the pot and giving one individual and one team their choice of a Concept2 rowing machine, SkiErg or BikeErg. There are minimum fundraising levels to qualify for the erg giveaway, and the number of meters you get matters too. Check the registration page for details. Sign up before April 3, 2018 and you will have the opportunity to order an event shirt for delivery in time for race day. People who register later can still order shirts, but they will arrive after May 5. Melanoma cancer is one of the deadliest forms of the disease. One person dies from it EVERY HOUR. Think about that: In the time it takes you to finish your workout at the gym, one person has died from melanoma cancer. On-water rowers and outdoor athletes in general are at great risk for cutaneous melanoma due to their exposure to the sun. Prevention is critical. And much easier than treating this deadly disease, as we at UCanRow2 know all too well. That makes Meters for Melanoma a labor of love for us. Meters for Melanoma 2017 from UCanRow2 on Vimeo. WHERE: Anywhere you can find a rowing machine, SkiErg or BikeErg! WHY: To raise funds for melanoma research and awareness. Our goal is to raise at least $20,000 for these activities, which will then be matched by an anonymous donor. HOW: Grab your team, or sign up as an individual at this link. NOTE: While it is Terry’s hope that everyone will be active in some way during this weekend, you DO NOT need to row to participate. Virtual rowers are welcome, too! Questions? Post them in the comments. 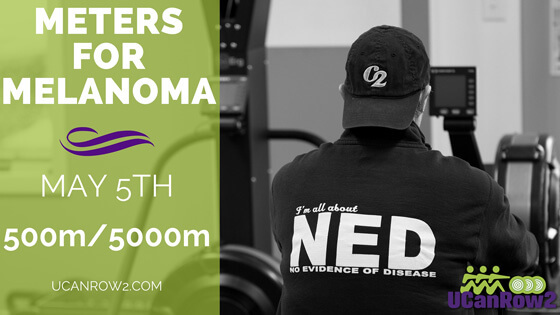 Come row with us and help us fight melanoma! Melanoma is one of the deadliest cancers there is. Someone dies every hour from the disease. Sun-baked on-water rowers are especially at risk for the cutaneous form of melanoma. METERS FOR MELANOMA was created to support the Midwest Melanoma Partnership‘s work to support research to find a cure. Often melanoma gets mistaken as being solely “skin cancer” that can largely be prevented by minimizing your exposure to the sun’s UV rays. While melanoma certainly CAN and often does occur on the skin, it turns out that there are two other forms of the disease, mucosal and ocular. You don’t have to have any sun exposure at all to come face to face with one of the disease’s most aggressive forms: mucosal melanoma. We’ve learned that in spades at UCanRow2 as our own Terry Smythe has been very publicly riding the cancer rollercoaster since late 2013. Never, EVER one to take things easily or lying down, Terry is taking cancer on with guns blazing, and using her fight as a platform to educate others about the disease. Enter METERS FOR MELANOMA, our annual fundraiser to support melanoma research and the tremendous efforts of the Midwest Melanoma Partnership. 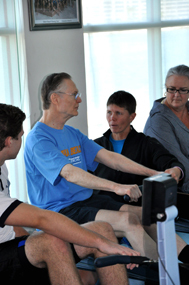 Join us each year on May 5 — Terry’s birthday — and row or SkiErg 500 or 5000 meters, you pick. If you don’t have access to an erg or would prefer to do another fitness activity, feel free! Do you need a place to row or ski? Check the links below to find a rower or SkiErg near you. Please join us for some fun on May 5 and make a difference for Terry and everyone else fighting melanoma. You’ll get a cool t-shirt, and our eternal thanks for helping with a really important cause. Email us your 500 or 5000 meter time and you might win a cool prize! Register now and we’ll get you set up. We’ve been so fortunate to count on the support of our local news media in this effort. Click below to see the story that TV6 Upper Michigan’s Source did on our effort in its first year. Do you have a melanoma or cancer story to tell? Has rowing made a difference in your recovery? Please tell us about it in the comments below, you deserve a shout-out!! Rowing Certification Hits Central Florida! Yessss! It’s been too long since we last offered our indoor rowing certification in Florida. It’s high time we fixed that, and we are! Thanks to our kind hosts, Villages Indoor Rowing in Summerfield, we’ll be offering both our Indoor Rowing Basic Course and the follow-up Programming Intensive the first weekend in December – December 5 & 6 to be exact. The Basic Course is your rowing instructor starter kit, and it’s the course you’ll need if you want to add your name to the growing list of certified rowing instructors around the US and the world. The Programming Intensive, meanwhile, is a deeper dive into the fine art of programming classes for athletes of all ages and stages. If you don’t have a lot of background in teaching rowing classes, or if you’re going to be working with seniors or weight loss clients, for example, this course is for you. You’ll need to take the Basic rowing certification before you can sign up for the Programming Intensive but they don’t have to be taken the same weekend. We don’t offer the Programming Intensive very often, so if you’re interested you should dive in! Questions? Post ’em up in the comments and we’ll get back to you ASAP. Special Olympics AND Rowing? Count Me In! UCanRow2 and Concept2 are headed to the Special Olympics 2014 USA Games! It’s the first time ever for these national games, and we need your help. If you’re in the Princeton, NJ area, or could be on Thursday, June 19, we’d love to have you join us for a day you won’t soon forget. Promise! Concept2 will give you a cool volunteer t-shirt as a small thank-you, too. Bonus! Picture this: 18 ergs hooked up for 500-meter racing, the results running on wide screens, Special Olympics athletes giving it their all while their coaches, teammates and you cheer them on. It’s an electric atmosphere that’s hard to describe in words, so take a look at this video and these photos to get more of the flavor. What would you be doing? We need your help to get athletes signed up to row, give them a super-quick learn-to-row on the erg before they race, get them set up on their machine, and most of all cheer them on and help create that electric atmosphere. 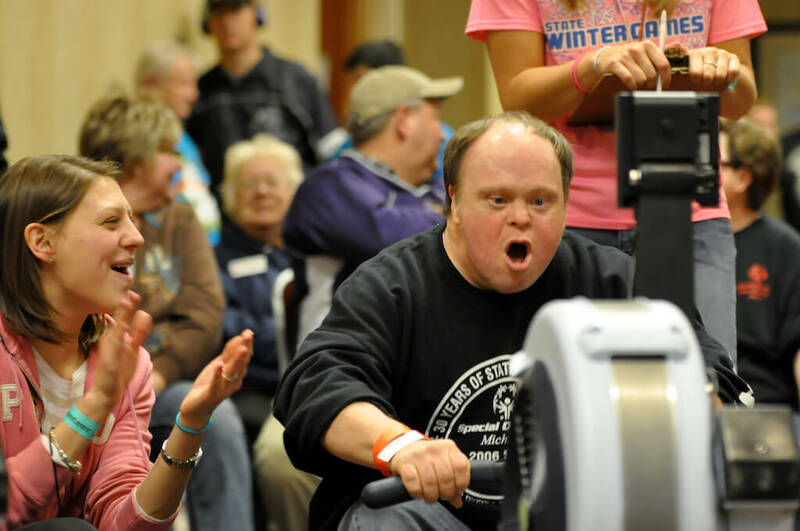 UCanRow2 has been present and accounted for at the Special Olympics Michigan winter and summer games for more than a decade but this is the first time for bringing indoor rowing to the Special Olympics national stage. To put it mildly we are PUMPED and ready to ROCK THIS ROW. Sound good? Better than good? It will be! If you’re interested in helping out, or have questions, drop us an email at info@ucanrow2.com and we’ll get you set up. 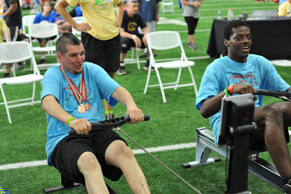 Have you worked with special olympics or in other areas of adaptive rowing? We’d love to hear your stories, leave us a comment and tell us more. Have you ever wanted to learn to teach indoor rowing – or just perfect your own technique – from an Olympian? Here’s your chance: Heather Alschuler, a former Canadian Olympian, national teamer and now accomplished indoor rowing evangelist in Seattle, is bringing her talents to UCanRow2’s Indoor Rowing Basic Course. Heather will be leading the Indoor Rowing Basic Course at Seattle’s Pocock Rowing Center on Saturday, April 13. Attendees at the rowing cert will have an opportunity to get individualized critiques of their rowing on the Concept2 rowing machine, learn how to put together a class on the machine, and pick up important tips on working with different populations of exercisers. Want to know how best to take care of your Concept2 rowing machine? You’ll learn that too. The course will be led by Heather Mandoli Alschuler, who has been involved in rowing on and off the water since the day someone brought an erg to her high school P.E. class. As an athlete, she was an All-American rower at the University of Michigan and then went on to row for Team Canada for five years at various World Cup and World Championship regattas. She raced primarily in the women’s pair and eight events, placing sixth or higher in every international race and capped off her career in the women’s 8+ on the 2008 Olympic team. Particularly well-rounded as a coach, she has worked with everyone from novices to aspiring Olympians to masters. She is the Erg Ed instructor and coordinator for Row to the Future‘s Erg Ed program, which is setting the bar for other cities to follow in bringing rowing into schools. The Indoor Rowing Basic Course fee is $275, with an Early Bird rate of $225 until March 23. Ready to register? Sign up! Things are slowly but surely coming back together in New Jersey after Superstorm Sandy’s wreaked havoc across many areas of the Garden State in November. It’s been a rough road and continues to be one, but Navesink Indoor Rowing, which hosts our New Jersey Indoor Rowing Foundations trainings, is finally back up and running and ready to go. YAY!!! 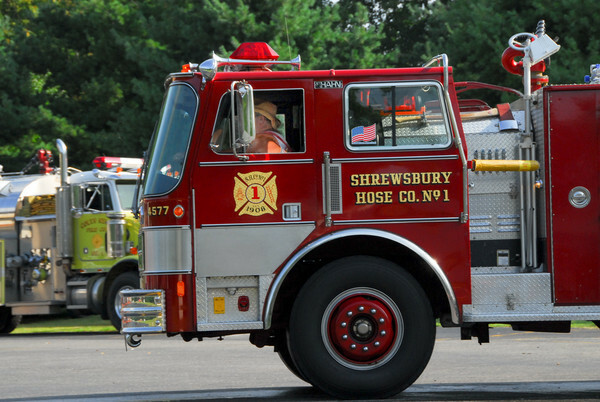 We’re thrilled to be able to announce that our next indoor rowing cert in New Jersey is Saturday, Jan. 26 in Shrewsbury at Hose Co. #1’s firehouse. It’s the perfect opportunity to either learn how to teach rowing (either to groups or for personal training) on the Concept2 indoor rower, or perfect your own technique and performance on the machine. Have you been eyeing a PR on your next 2k? This might be just the place to up your game to get there. To sweeten the deal we’re donating a percentage of every registration to Sandy relief efforts. 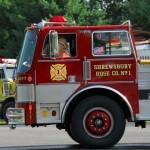 Things are improving in New Jersey but there are still a lot of hurting families, we’d like to do our part to help out. So you’ve got a chance to do something great for yourself and for the community on this one! Jump in, this is going to be an amazing day! Join us, and if you’ve taken one of Chad’s trainings in the past we’d love to hear your impressions in the comments! On November 13th, hundreds of people in fitness centers around the world came together to Sweat for a Vet to celebrate Veteran’s Day and one of the greatest lessons we have to learn from them, their resilience. I represented Concept2 at the main Sweat for a Vet venue, Tysons Sport & Health, where well over 100 able-bodied and disabled people pedaled Spin bikes, Krankcycled and rowed for three hours to raise funds to buy fitness equipment for disabled vets. Rowers were represented well by the crew from Capital Rowing Club’s Capital Adaptive program. They kept the flywheels spinning on five rowing machines throughout the three hours and racked up nearly 145,000 meters in the process. Big thanks and congratulations to all of them! Sweat for a Vet was organized by Project VisAbility, which works to get disabled people jobs in the fitness industry and in so doing both help them find new careers and change perceptions of people with disabilities. Based on what I saw, that formula is a winner. The biggest thing that struck me was the event’s inclusiveness: wheelchair tires and sneakers mixed in beautiful synchronicity on the floor, able and disabled bodies working together. Everyone was there for the best reason, creating power strokes of endurance for a good cause, through pedal strokes, bike strokes and rowing strokes. There were some notable people in attendance, including Spinning and Krankcycle creator Johnny G, but for me the real stars were the incredibly fit Project VisAbility “Inspirations,” fitness instructors who shared their stories of how they were disabled and came back from their injuries, in part through fitness. In addition to their tales of bravery, you couldn’t help but be inspired by these people’s leadership on the workout floor, sweating as much or more as anyone else. It was a great reminder that “disabled” doesn’t mean “unable.” On the contrary, I often find in my work with UCanRow2 that disabled people have a much better work ethic and attitude than their able-bodied counterparts. No matter our size, age or ability, there is a workout that’s right for us all and we have no excuse not to keep doing as much as we can with our bodies, every workout, every day. So what’s your workout for today? The flywheels will be spinning nonstop this Saturday, November 13, when a group of adaptive rowers take to the Concept2 rowing machines at Sweat for a Vet, a three-hour indoor cycling, Kranking and rowing event to raise funds to buy fitness equipment for disabled veterans at Walter Reed Army Medical Center and the National Naval Medical Center in Bethesda, MD. The main Sweat for a Vet event will be on-stage from 10:00 a.m. to 1:00 p.m. eastern at Tysons Sport & Health Club in McLean, VA. Not going to be in the area? We plan to post updates from the event here and on our Facebook page, and you can watch the whole thing live on Itzinn.com. Manning the Concept2 rowers at Sweat for a Vet will be members of the adaptive rowing program at Washington DC’s Capital Rowing Club, which is working closely with its partners – the U.S. Military Paralympic Program, the Naval Medical Center, Walter Reed, the Department of Veterans Affairs, and the National Rehabilitation Hospital – to bring rowing to disabled military veterans and civilians in the DC area. On hand to support the athletes will be Concept 2 master instructor Terry Smythe. Capital Adaptive’s mission is to introduce community-based rowing to people, including disabled veterans, with challenges such as spinal cord injuries, amputations, and visual and cognitive impairments. It’s not too late to support our veterans and their fitness. Contribute now to Sweat for a Vet!